Winter Wren - North Cross Road, Gill, Franklin Co., MA. November 23rd, 2017. The last week of the month had a handful of surprises in store while other species showed consistently in the same areas with Hooded Mergansers present daily at Barton Cove, Gill and reaching triple digits on Nov 28th (110)! Indeed Barton Cove proved to be something of a 'sweet spot' with a Northern Shrike rather briefly on the 26th, four White-winged Scoters on the 27th and a Winter Wren on the 29th. Good numbers of Winter Wrens continued along North Cross Road, Gill with a minimum of five staging there though I'm expecting them to move on when the freeze starts in earnest. Winter Wren - Barton cove, Gill, Franklin Co., MA. November 28th, 2017. White-winged Scoters - Barton cove, Gill, Franklin Co., MA. November 27th, 2017. The Turner's Falls power canal has seen a continual build up of wintering waterfowl as birds fly into roost in the evenings. Numbers vary day by day but upwards of 1100 Canada Geese, 110 Common Mergansers, 75 Common Goldeneye and 175 Mallard have been resting on the canal in late evening, and two Green-winged Teal showed up there on the 30th. Common Mergansers - some of the 98 birds counted at the Turner's Falls power canal, Franklin Co., MA. November 28th, 2017. Numbers of large gulls remained relatively stable with the only obvious new arrival being an Iceland Gull on the 28th. Iceland Gull (kumlieni) - first-cycle, Turner's Falls power canal, Franklin Co., MA. November 28th, 2017. On the 28th I also had a brief view of an Oregon 'type' Junco at Gate 35 in the Quabbin watershed. I say Oregon 'type' because, while clearly hooded, the views were so poor that I couldn't rule out the hybrid form Cassiar Junco (J.h.cismontanus) which I have seen two or three times before in the Pioneer Valley. Away from feeders, viewing juncos well enough to see detail is pretty difficult in our area and I'm afraid that I'll have to let this one go. Oregon/Cassiar Junco - North Quabbin (Gate 35), Franklin Co., MA. November 28th, 2017. Seen only very briefly but certainly appeared 'hooded' with light orange-buff flanks. The 28th also produced a 'new' site for Northern Saw-whet Owls in Gill when I had three birds calling at a spot that I'd previously scouted in daylight. I had a wonderful evening with three very vocal saw-whets though only had brief views of one. November also continued to produce an above average number of encounters with Eastern Screech-Owls in the Turner's Falls area. Eastern Screech-Owl - Turner's Falls, Franklin Co., MA. November 30th, 2017. Ring-necked Ducks (2) and Lesser Scaup (3) - Barton cove, Gill, Franklin Co., MA. November 27th, 2017. Mute Swans - Barton Cove, Gill, Franklin Co., MA. November 28th, 2017. Peregrines - sparring at the Turner's Falls power canal, Franklin Co., MA. November 17th, 2017. Carolina Wren- Turner's Falls, Franklin Co., MA. November 27th, 2017. Hermit Thrush - Turner's Falls, Franklin Co., MA. November 12th, 2017. Lesser Black-backed Gull (juvenile, third from right) - Turner's Falls power canal, Franklin Co., MA. November 16th, 2017. The last week has seen a mixed bag of falling temperatures, light snowfalls and occasionally blustery conditions. The high turnover birds experienced through the greater Turner's Falls area seems to have slowed right down with relatively few new birds arriving this week. However, the numbers and presence of large gulls has improved with up 65 Herring, 25 Great Black-backed, 2 - 3 Lesser Black-backed Gulls and a single Iceland (adult) Gull showing up from the 15th, and up to 120 Ring-billed Gulls from the 19th. Lesser Black-backed Gull (juvenile preening, third from right) - Turner's Falls power canal, Franklin Co., MA. November 16th, 2017. Ring-billed Gulls - Turner's Falls, Franklin Co., MA. November 19th, 2017. With the exception of Common Mergansers (up to 65 on the power canal) and Hooded Mergansers (up to 65 on Barton Cove) waterfowl numbers have remained consistently low with 14 Ring-necked Ducks on the 19th being the only stand-out moment. Otherwise a Common Loon, 3 Lesser Scaup, 2 Common Goldeneye remained at Barton Cove to the 21st, and a Pied-billed Grebe was present there on the 20th. Ring-necked Ducks - over Barton Cove from Unity Park, Turner's Falls, Franklin Co., MA . November 19th, 2017. Bald Eagles have been present throughout and relatively active with five seen together at the Turner's Falls Rod and Gun club on the 19th, and a pair actively chasing the large gulls at Barton Cove also on the 19th. Similarly, Peregrines have been present in Gill, Northfield and Turner's Falls with two together sparring over the power canal on the 21st, and a juvenile hunting Hooded Mergansers also on the 21st. 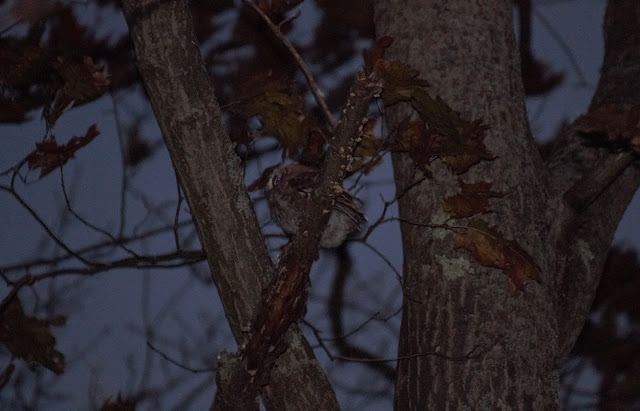 Eastern Screech-Owls surprised me twice with a nice red phase appearing at dusk at Turner's Falls on the 19th, and another calling from a new site (for me) at dawn on North Cross Road, Gill on the 20th. Also on the 20th, whilst on the way to the airport, I made a slight detour to look for a Snowy Owl being reported in Hadley and met with success though the bird looked totally out of place sat atop a heavily manicured evergreen hedgerow. Eastern Screech-Owl - Turner's Falls, Franklin Co., MA. November 19th, 2017. Snowy Owl - Hadley, Hampshire Co., MA. November 20th, 2017. Bald Eagle - Unity Park, Turner's Falls, Franklin Co., MA . November 19th, 2017. Merlin - Gill Riverside, Franklin Co., MA. November 17th, 2017. The most interesting passerines of the week concern a smattering of flyover Snow Buntings and Purple Finches at several locations in Gill and Northfield, and gradually increasing numbers of American Tree Sparrows with eight on North Cross Road, Gill on the 21st, just by way of an example. We also had two Fox Sparrows in our yard in Northfield on the 18th and Winter Wrens have been frequent and easy to hear calling at dawn along North Cross Road, Gill with three or four individuals present. Dark-eyed Junco - Turner's Falls, Franklin Co., MA. November 21st, 2017. American Tree Sparrow - Turner's Falls, Franklin Co., MA. November 21st, 2017. Red-throated Loons - Turner's Falls Rod & Gun club, Franklin Co., MA. November 14th, 2017. After an all-too-brief Red-throated Loon at Barton Cove/Unity Park on Nov 6th, it was more than rewarding to see a mini arrival of the species at the Rod & Gun club this morning. The day had a pretty dreary start with sleet showers and apparently no new waterbirds at Barton Cove but as I arrived at the Rod & Gun club just before 8am, a party of three Red-throated Loons touched down on the water. My impression was that they'd just arrived but I couldn't say for sure. Some 35 minutes later, all three loons began giving wailing calls from the water and a fourth Red-throated Loon dropped out of the sky to join the group. The quartet then settled in for the day and quite a few birders got up to see them. Somewhat surprisingly, no other waterfowl appeared to be associated with the loon movement, at least at Turner's Falls, and I didn't detect anything new although it was nice to see the Common Loon at Barton Cove lingering for its fourth day. Camera data info placed the fourth bird arriving at 08:38 hours, slightly later than I initially thought. Other birds of note included single Snow Buntings at Barton Cove boat ramp in Gill, and at South Ferry Road in Montague, plus a 'getting late' Yellow-rumped Warbler, also at the boat ramp. The evening saw the first significant arrival of Great Black-backed Gulls with around a dozen dropping into the cove at Unity Park. With them came a crisp, smart looking juvenile Lesser Black-backed Gull before a pair of Bald Eagles flushed the lot and began chasing down one of the Great Black-backed Gulls. After sunset, I tried my luck at a traditional spot for Northern Saw-whet Owls in the north of Franklin County and had some excellent success with three individuals heard giving a broad range of vocalizations including soft 'tooting', squealing or wailing calls, 'kew' calls often delivered in twos or threes and sometimes strung together in a short series, and a scolding 'chitter' which I tend to hear less frequently than the other call types. In the distance, a pair Barred Owls called back and forth as if to supplement the pair of Great Horned Owls that I heard and saw in courtship in Gill this morning - three owl species for the day! The best actual 'sighting' in the woods this evening was a Flying Squirrel that glided some distance before landing flush on the side of a deciduous trunk. I haven't seen too many Flying Squirrels in Western Mass and to see one actually 'flying' was completely cool! This month's sensational local birding continues unabated. November is certainly living up to its reputation for rarities and this morning I did a little chasing, heading south for the Hadley Honeypot a mere thirty minutes from Gill. News of a MacGillivray's Warbler at the Honeypot appeared on the Massbird listserve yesterday afternoon. The finder, Ted Gilliland, provided excellent documentation in his ebird report leaving no doubt about the ID. This species has been on my radar as a potential vagrant waiting to be discovered in the Gill/Turner's Falls area for a couple of weeks and I was naturally intrigued to find out a bit more about the bird, its habitat choices and how it would sound in the field in a Western Mass context versus California where I saw and heard several on a group tour as recently as September. So, I dropped Matan at school at 08:30 and then headed down to the Honeypot reaching That's a-Plenty Farm at 09:05. After that, it was hard work, very hard work in fact and it took me and a small group of half-a-dozen birders some 90 minutes to get decent views. The bird was often vocal but usually stayed buried deep inside a patch of dead and dying nettles. Still, overall it was a great experience watching an extreme skulker at close range and obtaining a few record shots and sound recordings. MacGillivray's Warbler is a state review species and I'm only aware of two other reports in the Pioneer Valley; one from Southwick, Hampden County, on September 22nd, 1995 (S.Kellogg) and a male in Northampton, Hampshire County on October 11th, 1998 (T.Gagnon). Fingers crossed, the next one will be in Franklin County! Gracious thanks to Ted Gilliland for a fantastic find and to Scott Surner and Larry Therrien for bringing me up to speed on the bird's behavior this morning. MacGillivray's Warbler - Hadley Honey Pot, Hampshire Co., MA. November 13th, 2017. The ultimate skulker only offering brief, often obscured views. Elsewhere, waterfowl migration seems to have tapered a little at Turner's Falls but the annual late autumn build up of Hooded Mergansers has been nice with up to 55 birds in Barton Cove on Nov 12th though fewer today. Also of interest today, a Common Loon for its third straight day at Barton Cove, and a lingering Red-breasted Merganser at Unity Park, also 2 Gadwall, 3 Ring-necked Ducks, 2 Lesser Scaup and 4 Common Goldeneye at Barton Cove on Nov 12th-13th, and a Long-tailed Duck at the Rod and Gun club on Nov 11th. Hooded Mergansers - Barton Cove, Gill, Franklin Co., MA. November 12th, 2017. Hooded Merganser - Barton Cove, Gill, Franklin Co., MA. November 11th, 2017. Yellow-bellied Sapsucker - juv/first-winter, Northfield, Franklin Co., MA. November 12th, 2017. Red-breasted Merganser - female, Unity Park. Turner's Falls, Franklin Co., MA. November 13th, 2017. This bird has been lingering here for about a week but is usually tucked under the bank on either side of the river. Great Cormorant (left) with Double-crested Cormorant - Unity Park, Turner's Falls, Franklin Co., MA. November 8th, 2017. November, the month that just keeps on giving! The 8th dawned cold, gray and full of snow flurries, a remarkable contrast from just two days prior when it dawned a muggy 62 deg F in Gill. With winds in the north I made an effort to get down to Turner's Falls before taking Matan to school and was rewarded with two Great Cormorants that arrived singly at the Rod & Gun club with one heading downstream to Unity Park, and the other departing south after spending just a few minutes on the water. Once again, the broad expanse of river above the Turner's Falls dam proved that its an attractive draw to scarce and unusual species but in the same respect has little to hold such birds which usually move on quickly. On a personal level, this was only my second observation of Great Cormorant in Franklin County, my first being in North Quabbin in mid-November 2005. I'm aware of others, specifically in Turner's Falls with one from Brian Kane at the power canal on February 13th, 2005 and another (with photos) from Peter Garigan on December 7th & 8th, 2016, the latter being at the Rod & Gun club. Great Cormorant - Turner's Falls Rod & Gun club, Franklin Co., MA. November 8th, 2017. The first bird arriving from the NE at 07:22 hours before continuing down river. Great Cormorant - Unity Park, Turner's Falls, Franklin Co., MA. November 8th, 2017. Presumed same as the bird featured in flight above......this shot was taken at 07:52 hours. Remarkably, despite the snow showers and a marked drop in temperature, the long staying White-eyed Vireo surprised me once again in its favored nook by the Connecticut River though it was a no show on the 9th.....but the same patch of scrub attracted no less than three Hermit Thrushes that particular morning. Great Cormorant - arriving in snow showers, Turner's Falls Rod & Gun club, Franklin Co., MA. November 8th, 2017. This was the second bird and it departed at 07:38 hours heading south towards Montague Plains. Late on the 9th, an ebird report concerning a relatively local Snowy Owl surfaced from Bill Lafley in New Salem. The morning of the 10th dawned frigid with a blustery north-westerly wind and I had concerns that the Snowy Owl would have moved on overnight but fortunately for us, Bill Lafley relocated his bird and posted the news in a timely manner. By mid-morning Matan and I were enjoying reasonable views of the owl from the road as it warmed itself on a dry-stone wall off Wendell Road in New Salem. Snowy Owl - New Salem, Franklin Co., MA. November 10th, 2017. Early morning on the 10th had also seen a nice arrival of waterfowl at Turner's Falls including 31 Bufflehead, 3 Ring-necked Ducks, and a Gadwall among some lingering Lesser Scaup, American Wigeon and Green-winged Teal. The conditions were so frigid that most of these were hunkered together in one sheltered cove. Eastern Screech-Owl - Gill, Franklin Co, MA. November 7th, 2017. A chilly, raw evening produced this fine Eastern Screech-Owl at one of my traditional spots in Gill. It was cool and windy with wintery showers so my expectations were low but the bird put on a nice vocal and visual show, eventually showing superbly well in a relatively soft spotlight. It was the highlight of a day that didn't quite live up to expectation as cold, clear air from the north allowed almost all of yesterday's species to depart overnight including the Redheads. However, new waterbird arrivals in the greater Turner's Falls area included 15 Buffleheads, a Lesser Scaup and a Pied-billed Grebe while a Ring-necked Duck and 2 American Wigeons remained, and Common Goldeneyes built up to at least 16 birds at the power canal. Ruby-crowned Kinglet - Northfield, Franklin Co., MA. November 7th, 2017. Redheads - Barton Cove, Gill, Franklin Co., MA. November 6th, 2017. Yet another fascinating day for migration in northern Franklin County, a day which really began the previous evening as warm, moist air brought fog and heavy rain showers all night resulting quite a few birds. The previous evening brought the first major arrival of gulls to Turner's Falls as a single flock of 15+ Ring-billed and 45+ Herring Gulls suddenly appeared out of the gloom and settled at the power canal. This morning (11/06) I did my run in the darkness and finished with enough time to get down to Barton Cove for first light. It looked quite barren at first but an American Coot suddenly appeared next to the boat ramp and 3 Redheads looked nervous as they hung around with the Canada Geese. At the Rod & Gun club good numbers of Canada Geese were already departing by the time I arrived and there was no sign of the previous day's Pink-footed Goose seen by just two lucky observers mid-morning. But I did find 16 Green-winged Teal, 2 American Wigeon, a Bufflehead, a Common Goldeneye, 2 Ring-necked Ducks and 2 Red-breasted Mergansers among other things whilst I was there. Red-throated Loon - Barton Cove, Gill, Franklin Co., MA. November 6th, 2017. By 8am I was back home and back into our daily routine but sneaked out just before noon amid yet more heavy showers. The Redheads remained on Barton Cove but as attractive as they were, the bird that really captured my imagination was a Red-throated Loon way out on the cove. Since I was some distance away, I decided to move over to the boat ramp for better views, proceeded to lose it and never saw the bird again! It disappeared just as mysteriously as it had appeared. Despite watching the Gill/Turner's Falls area regularly during spring and fall migration I couldn't recall ever seeing a Red-throated Loon in the area before and for some reason it looked unexpectedly out of place on Barton Cove! American Coot - Barton Cove, Gill, Franklin Co., MA. November 6th, 2017. The balmy, wet southerlies continued for much of the day, grounding the Redheads for the whole day and bringing a nice male Long-tailed Duck to the Rod & Club in late afternoon. On the other hand, 8 Common Goldeneye at the power canal looked more like returning winterers than actual migrants. As if the day wasn't complete enough, the White-eyed Vireo once again showed up in its sheltered nook by the Connecticut River in Turner's Falls. White-eyed Vireo - Turner's Falls, Franklin Co., MA. November 6th, 2017. White-eyed Vireo - adult, Turner's Falls, Franklin Co., MA. November 1st, 2017. The month started with a nice sharp frost, very welcome after an incredibly warm October. The day continued to be cool, windless and cloudy creating a pretty interesting atmosphere much more in keeping with the conditions we expect in late fall. In between errands I checked a number of spots around Turner's Falls notching up close to 50 species before noon. Oddly enough I failed to connect with any of the waterfowl movements well reported on the local social media outlets today though I did have a 'token' Brant fly past me at Unity Park. Brant - adult, Unity Park, Turner's Falls, Franklin Co., MA. November 1st, 2017. But the day held other surprises, namely in the form of lingering 'scarcities' that I felt sure had moved on, but then popped up and presented themselves. The White-eyed Vireo in Turner's Falls was one of these, and the Cattle Egret showed up again at Upinngil after seemingly being absent all day yesterday. A calling Yellow-bellied Sapsucker on North Cross Road, Gill was another surprise this morning. Cattle Egret - Gill, Franklin Co., MA. November 1st, 2017. Notables in Turner's Falls included Hermit Thrush, Ruby-crowned Kinglet, Winter Wren and a large flock of 85 Cedar Waxwings. Hermit Thrush - Turner's Falls, Franklin Co., MA. November 1st, 2017. Ruby-crowned Kinglet - Turner's Falls, Franklin Co., MA. November 1st, 2017.